Often served on the skewer along with vegetables, as in shish ka bobs, souvlaki can also be served on a platter with potatoes or on pita bread. It is often accompanied by a cucumber yogurt sauce. For tourists in Greece, and also in other countries, particularly the United States, souvlaki may be made with chicken or beef. The nutrition from souvlaki comes primarily from the meat, yogurt sauce and whatever vegetables are served with the souvlaki. If served as a sandwich on pita or with sides of potatoes, the dish becomes more caloric with greater amounts of fat and carbohydrates. 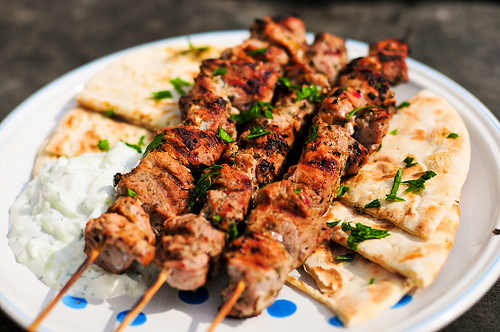 The main ingredient of souvlaki is the pork, lamb, chicken or beef. All these meats provide varying amounts of protein, depending on the cut and type of meat and the serving size. A 3 oz serving of these meats provides 22 g to 27 g of protein, with chicken and beef providing the most protein. The meats provide 77 to 84 mg of cholesterol and 15 to 19 g of fat, except for chicken breast, which has only 3 g of fat. A 3 oz serving of the pork, beef and lamb have 6 or 7 g of saturated fat and 235 to 275 calories, while chicken breast has less than 1 g of saturated fat and about 140 calories. Overall, chicken provides the most protein and the least cholesterol, fat and saturated fat. The marinade for souvlaki typically includes olive oil, lemon juice, white vinegar, garlic, dry mustard, paprika, sage, savory and thyme. For the most part, these flavorings provide few calories and little nutrition, except for the olive oil, which has monounsaturated fat. Olive oil does add perhaps as many as 30 or 40 calories per 3 oz serving of meat, but it contains monounsaturated fatty acids, which raise good HDL cholesterol and lower bad LDL cholesterol. The vegetables typically served with souvlaki can include tomatoes, red and green pepper, onion and zucchini. These vegetables add vitamins A, B6 and C, as well as minerals such as manganese and potassium, but add only a few calories per ounce. The tzatziki sauce served with souvlaki contains yogurt, cucumber, olive oil, lemon juice, garlic and fresh dill. Most of these ingredients are fairly healthful. The yogurt provides protein and calcium and the cucumber adds vitamins C and K. The actual nutrition obtained in a 1.5 oz serving of the sauce is small, however, but the sauce nonetheless adds up to 60 calories to the total calorie count. If you eat souvlaki as a sandwich on a large pita, you get an additional 165 calories, 6 g of fat and 33 g of carbohydrates. The pita bread alone has 32 percent of the daily allowance of fat. Pita does provide some nutrition, including 11 percent of the daily allowance of protein, 5 percent of calcium, 9 percent of iron and 16 percent of folate. The calories contained in restaurant souvlaki varies, of course on the ingredients, recipe, serving size and accompaniments. Many restaurants in the United States serve chicken souvlaki, which reduces fat and cholesterol compared to the other meats. A 3 oz serving of meat alone contains about 170 calories, and chicken souvlaki wraps contain 440 to 540 calories. Chicken souvlaki served with lettuce, tomatoes, onions, peppers and tzatziki sauce at one restaurant has 489 calories, a reasonable number of calories for a restaurant meal. Make souvlaki at home using recipes, such as found at Food.com and All Recipes. Cut down the calories by using chicken as your meat, adding plenty of vegetables to your skewers and eliminating the pita bread. Also, conserve calories by using non- or low-fat yogurt for the tzatziki sauce. You can enjoy Greek fast food at home without the fat and calories normally associated with typical American fast food. Amazing Web site, Keep up the good job. thnx. Thanks for finally writing about >Souvlaki Nutrition Information | CL Health News <Liked it!